Why would I need self storage in St Petersburg, FL? There are a variety of reasons why you might need self-storage in St Petersburg, FL. How much is a storage unit in St Petersburg, FL? The cheapest storage unit in St Petersburg, FL is $47.00 per month. What size storage units do you have available in St Petersburg, FL? In St Petersburg, FL we have sizes that range from 5'x5' to 10'x30' to suit your storage needs. How much is it for a 5'x5' storage unit in St Petersburg, FL? The cheapest 5'x5' storage unit in St Petersburg, FL is $67.00 per month. 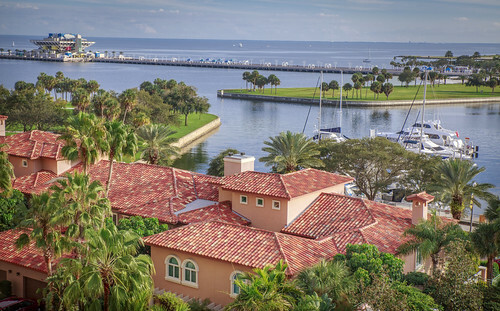 The city of St. Petersburg is one of the largest in Florida, and an integral part of the Tampa-St. Petersburg-Clearwater metropolitan area. St. Petersburg set a mark recognized by Guinness World Records for the most consecutive days of sunshine, logging over 760 straight days of sunny weather. On average, you can expect over 350 days of sun in the area, so there's plenty of opportunity to enjoy the local beaches and green spaces. The low cost of living and beautiful weather make St. Petersburg a popular relocation destination for retirees, but the city has been attracting a younger population in recent years, thanks to an active arts and culture scene, community events and family-friendly attractions. In 1875, General John Williams, who envisioned a city with broad streets, graceful parks and beauty everywhere, purchased the land now known as St. Petersburg. The city's co-founder, Peter Demens, played an important role in bringing the Orange Belt Railway terminus to the area in 1888. From there, St. Petersburg flourished, with its population more than quadrupling by 1900. In 1903, the city was officially incorporated and grew into a major port. Within a few years, St. Petersburg earned its first library, a city baseball team and commercial airline service. As it grew into a major tourist destination, the city's economy became even stronger. Throughout the mid- to late 20th century, St. Petersburg experienced several population booms that propelled it to the diverse metropolitan area it is today. Today, St. Petersburg has a diversified economy, with finance, health care, retail and high tech manufacturing among its largest industries. If you're planning to join the job market in St. Petersburg, you'll find a variety of jobs of both blue- and white-collar jobs. The city's biggest employers include Raymond James, John Hopkins All Children's Hospital, the Home Shopping Network and Publix Super Markets. In St. Petersburg's downtown district, you'll find a mix of towering skyscrapers, professional sports venues and cultural attractions. It's also home to the historic Haslam's Book Store, opened in 1933 and frequently visited by American writer Jack Kerouac. The North Shore Historic District, also called Old Northeast, is one of the city's best-known historic areas. It features lush native landscaping, Mediterranean-style architecture and nearly 3,000 historic buildings. The Grand Central District is home to a variety of local entertainment destinations. Running through the neighborhood is Central Avenue, which is lined with local cafes and small businesses, many of which are housed in brightly-colored buildings. Snell Isle was an uninhabited mangrove island until the 1920s, when a wealthy investor decided to purchase and develop it. Today, there are several high-end neighborhoods, shops and restaurants in the community, along with a population of manatees beloved by locals. Pinellas County Schools District serves public school students from prekindergarten through 12th grade. The district also offers a large adult education program. If you're interested in enrolling your child in private school, St. Petersburg has several options, both parochial and secular. There are several institutions for higher education in St. Petersburg. The University of South Florida St. Petersburg is among the largest in the area, serving several thousand students with a variety of degree programs. You can also pursue specialized degrees at schools like the Poynter Institute and Stetson Law School. Utilities: The city manages water and sewer services, and Duke Energy is the local power supplier. Garbage and Recycling: Residential trash and recyclables are collected on a regular basis. Your collection schedule will depend on your neighborhood. Transportation: The Pinellas Suncoast Transit Authority facilitates public transit in St. Petersburg. You can also ride a downtown sightseeing trolley on the St. Petersburg Trolley Downtown Looper route.. The median home value in St. Petersburg is considerably lower than the national average, which has played a large part in its steady growth. Whether you're looking for a single-family home or a rental in a multi-family community, you're sure to find something to fit your needs. Our lowest priced units in St Petersburg, FL average $54.00 per month. 323 people have reserved units in St Petersburg, FL in the past 30 days. There are 5 locations within St Petersburg, FL's city limits. There are 2 locations in St Petersburg, FL that offer AC and Heating features.